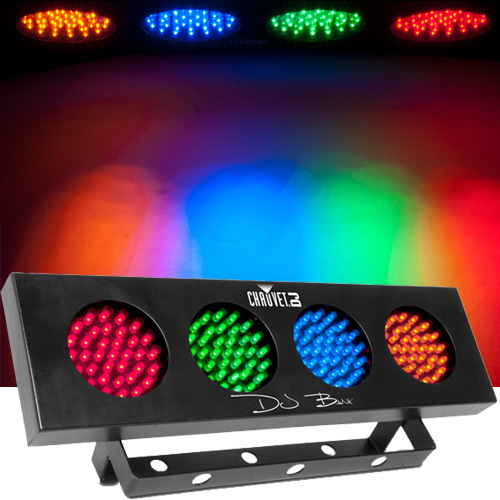 The new DJ Bank LED lighting system from Chauvet is an inexpensive way to add some sound activated lighting fun to your lighting rig. This is a perfect fill light for when the more club style lights are too distracting or when a change of pace is needed. This light also looks great projected on a wall behind a DJ or band. 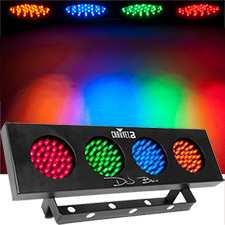 The Chauvet DJ Bank is a compact LED color bank effect light that can be hung flush to a wall or from the ceiling, thanks to built-in brackets.The DJ Bank light can even be used on the floor. The LED bank fixture features 4 lamps each with 35 LEDs of the same color�green, blue, red, yellow�for a splash of primary colors. 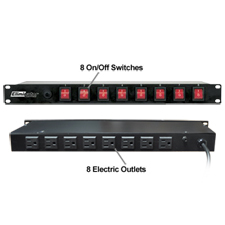 The Cauvet DJ Bank is a simple, economical lighting solution for any DJ setup, for accenting architecture, or as mood lighting in a small club setting. The DJ LED Bank is sound activated and fully automatic.